Ok, so I had better stop playing about with the tools of this website and actually try a blogpost. The other thing is I have tried to upload my favourite blogs, but they are not appearing on the sidebar yet. Please be patient with me as I am just learning all over again. This is really a practise post. Scotland is like another country. 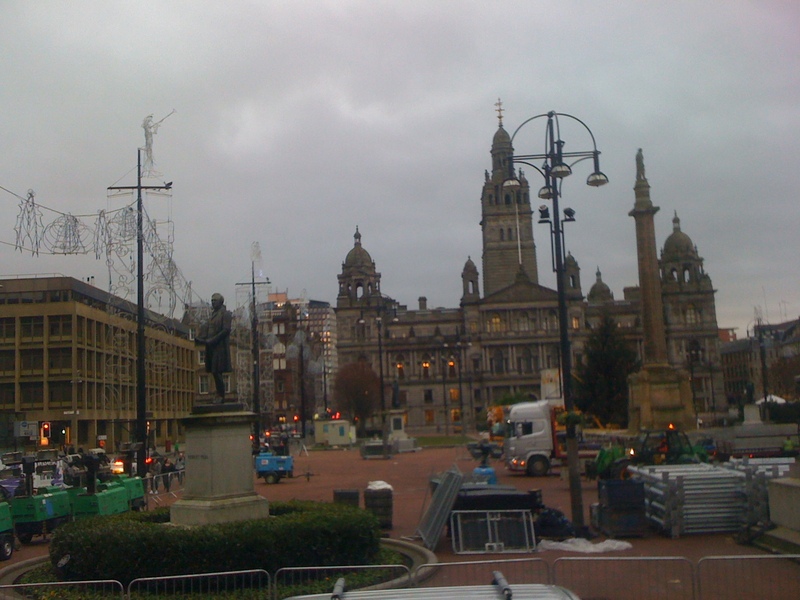 Previously, I had found it very difficult to understand Glaswegian people I met. I needed a translator, but actually, I found it easier than I thought to understand the language. Maybe my ear got attuned quickly but I found it surprisingly easy to understand the accent. They were, exceptionally friendly and helpful for city people (who are usually too much in a rush to give you the time of day) As mentioned before, every called me “hen” as a term of endearment, which I fond amusing. Did they want me to cluck? There seemed to be music all over the streets, bagpipes and others. There was a good atmosphere in the shopping streets. The Christmas lights had been turned on the evening before, so maybe that put people in festive mood. Then to my shock when I got money out of the cashpoint,(ATM) the notes were completely different than English notes! So the first thing I did was a 1hour 45 minute tour on the hop on hop off bus, to give me an overview of the city. 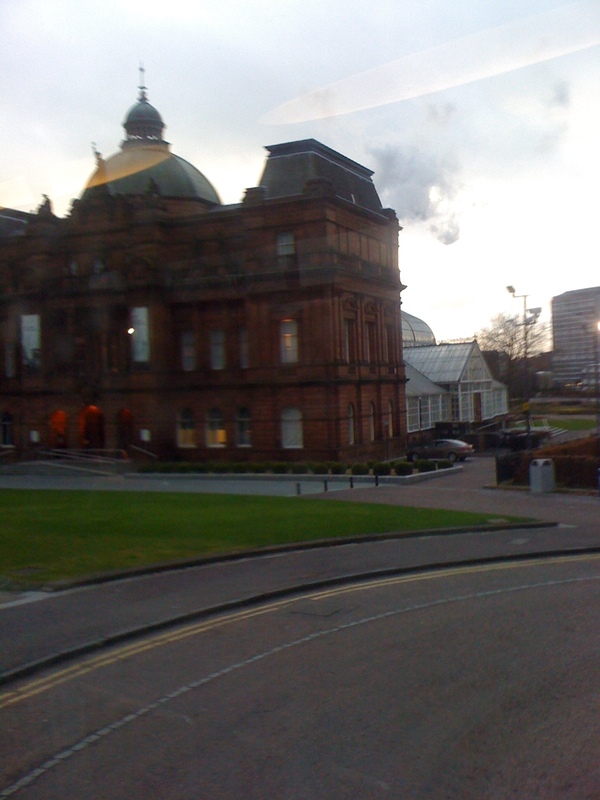 The peoples Palace, a very interesting social history museum in Glasgow Green. One of several green spaces in the city. 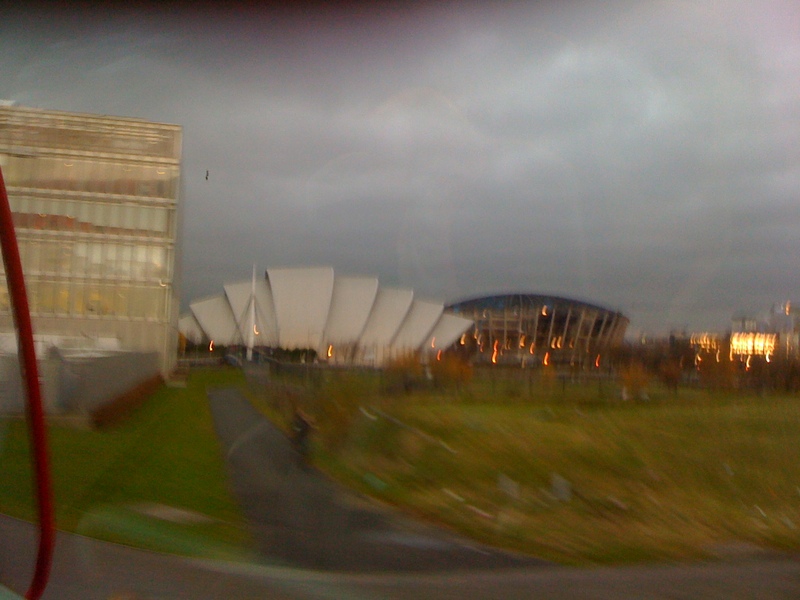 The building that looks like Sydney Opera house is the Clyde Auditorium. Phew! that was hard work but I think I have got the hang of pictures now. Should have enlarged them before I uploaded. This is good, I can leave a reply from my iPhone. Gives us a heads up when you are no longer using your original blog, OK?? Hi Nancy, don’t worry I will continue to use my original blogger blog until I am completely happy with this and I will give plenty of notice on the old one before I stop posting there. Denise, I am finally able to comment. I loved learning about your trip to Glasgow and am jealous you are going back to Paris in January. Enjoying your blog. Thanks for posting Harriett, nice to see you here.